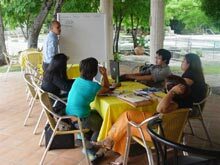 In response to numerous calls by Friedrich Naumman Foundation (FNF)’s alumni to reproduce International Academy for Leadership (IAF) liberal training workshops from Germany, FNF's Alumni Group held its first replication seminar at Antulang Resort, Negros Oriental from 26-29 September 2007. Entitled, “Education in the Philippines: Liberal Perspectives,” 23 educators, school administrators, government staffers and local officials discussed the present educational situation of the country, what it should be and what the liberal solutions are. Mr. Jose Mari Jonathan Antonio, alumnus of the IAF education seminar in Germany, coordinated the initiative on behalf of the Alumni Group, and invited the Foundation to Dumaguete City. He facilitated the seminar together with FNF Resident Representative Siegfried Herzog. “My exposure to the principles of liberal education in Germany spurred a commitment to echo such knowledge in the Philippines. There was a necessity to initiate this for local leaders because their decisions are significant to the development of national initiatives,” said Antonio. Siegfried Herzog set the tone of the three-day workshop by outlining the liberal concepts of education. This was complemented by a presentation by Mike Luz, former Department of Education (DepED) undersecretary of finance, on the role of education in a competitive world. Former DepED Secretary Florencio Abad ended the first day with a talk on the current education situation. Participants also experienced first-hand the discrepancy between what education should be, and what it currently is in their visit to Valencia public high school. They discovered insufficient numbers of teachers, as the school had a student ratio of 60-to-1, with five sections per year level. Retention of boys was also a significant problem, as their dropout rates were double to triple that of girls. The school however, did benefit from the DepEd’s Adopt-A-School program, with a local business donating computers for its computer lab. The public school visitation was complemented by a stop at Dumaguete City. Participants first stopped by its library hub to look into the DepED program for improving reading and comprehension skills. The library hub provides bilingual storybooks to the area’s elementary and secondary public schools. Books are arranged in bundles by subject area and grade or year level for the convenience of teachers, who can then check them out in bulk for re-lending to their students. Next, participants met with Assistant Schools Division Superintendent Victoria Galgo, Ph.D., to discuss more on the Adopt- A-School program. They then met with Fr. Enrique Balongag, president of Colegio de Sta. Catalina de Alejandria, in order to learn more about the Catholic school system, and they also met with Marina Mendoza, head of Dumaguete City’s Department of Social Welfare and Development, in order to discuss public day care centers. 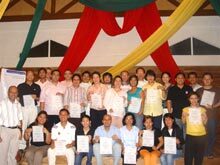 Participants pose with their certificates. After looking into the government’s solutions to the country’s education crisis, Dr. Chito Salazar, president of Philippine Investment-Management Education Network, talked about the need for the private sector to push for policy reform. He underlined the vital role of the private sector in reforming tertiary education, which is currently imperiled by the rise of substandard and poorly regulated state colleges and universities. On the last day, participants were divided into four groups and asked to draw up policy papers on education reform. “The seminar has proven to be an excellent learning experience for all, summed up Herzog. “The policy papers clearly showed how sincerely the participants grappled with the issues. It has become clear why education has to be a top reform priority in the Philippines,” he said. For more on the educaton seminar, listen to the Liberal Times Manila Podcast.